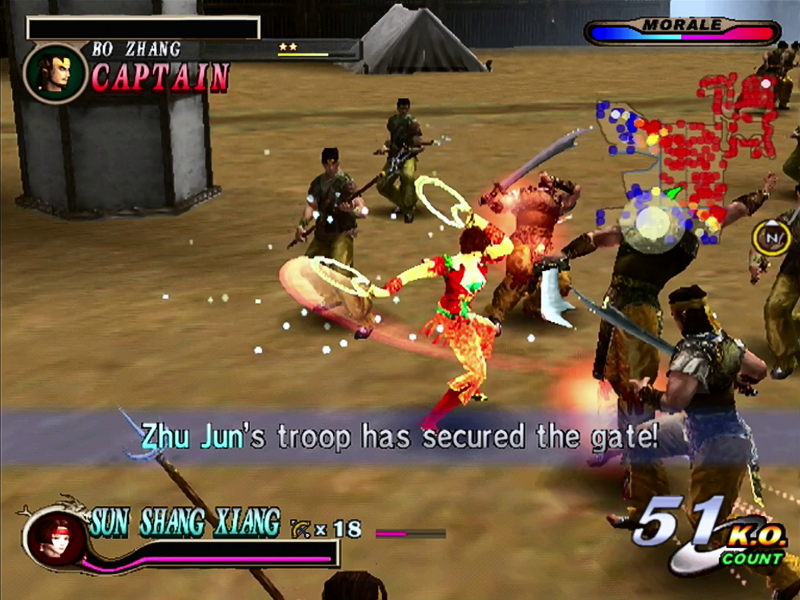 Dynasty Warriors 2, as we discussed in our look back at the history of the series as a whole, originally came out in 2000 as a launch title for the PlayStation 2. The reason I say this second game is “where it all began” rather than the original Dynasty Warriors on PS1 is because the latter was a one-on-one fighting game, and regarded as the only installment in a different series in Japan. 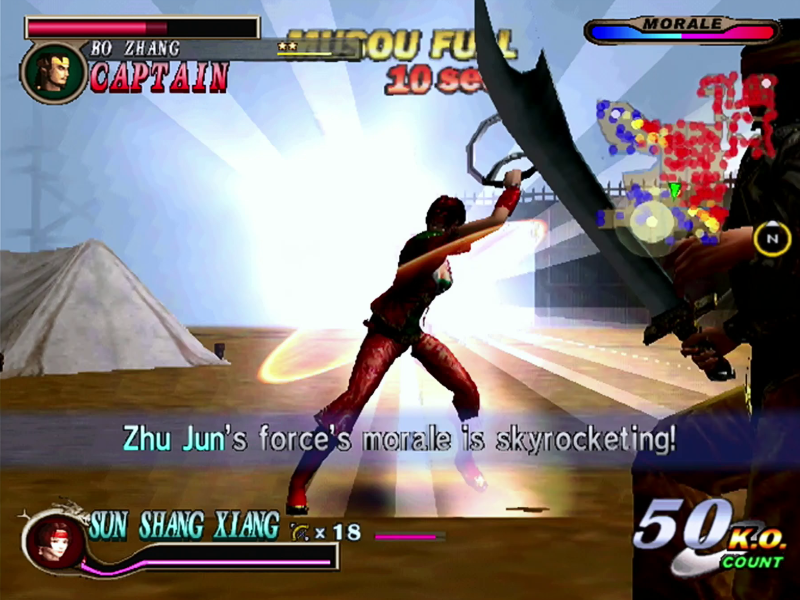 As such, Dynasty Warriors 2 is actually the first game in the Shin Sangokumusou franchise, and consequently the whole series has been a number behind the West since the year 2000. 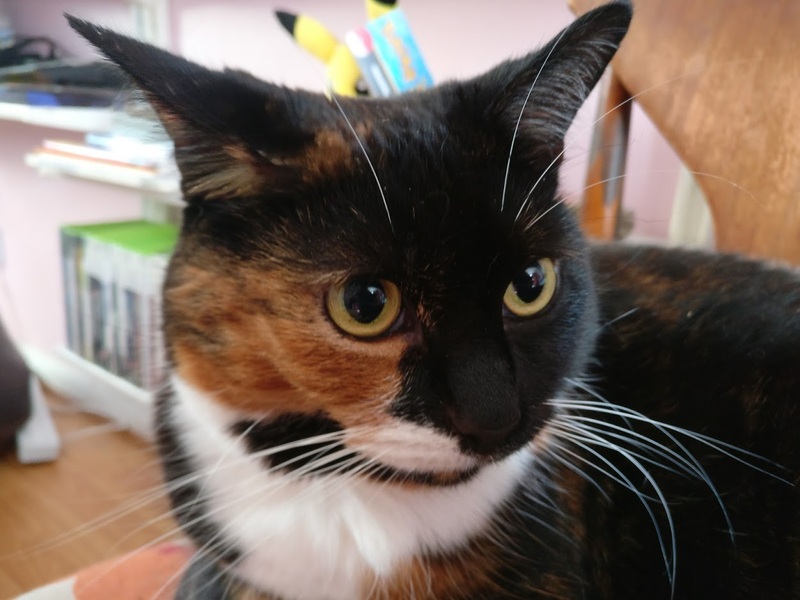 Dynasty Warriors 2 was moderately well received upon its original release by press and public alike, though it was also a little divisive; some lambasted it as little more than a button-mashing exercise, while others correctly recognised it as an action-strategy game. Blindly button mashing gets you nowhere in Dynasty Warriors 2, but thinking tactically and paying attention to the battlefield as a whole is just as important as your fighting skill. While it’s not a game with as much strategic depth as its contemporary and stablemate Kessen, it’s always been important to acknowledge this aspect of the series. 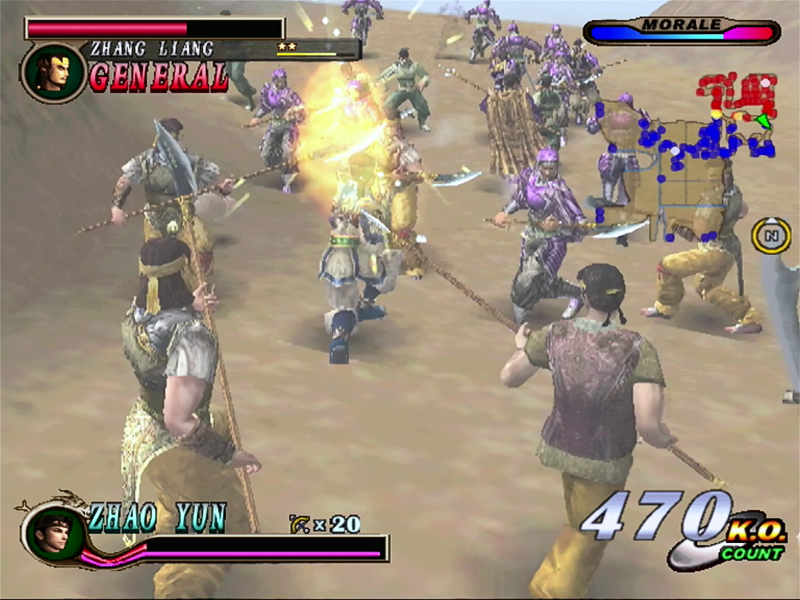 In Dynasty Warriors 2, you pick one of 28 different playable characters — though some need to be unlocked — and play through eight stages that correspond to important battles throughout the “Three Kingdoms” period of Chinese history, beginning with the Yellow Turban Rebellion of 184 AD and continuing on to the Battle of Wu Zhang Plains in 234 AD. 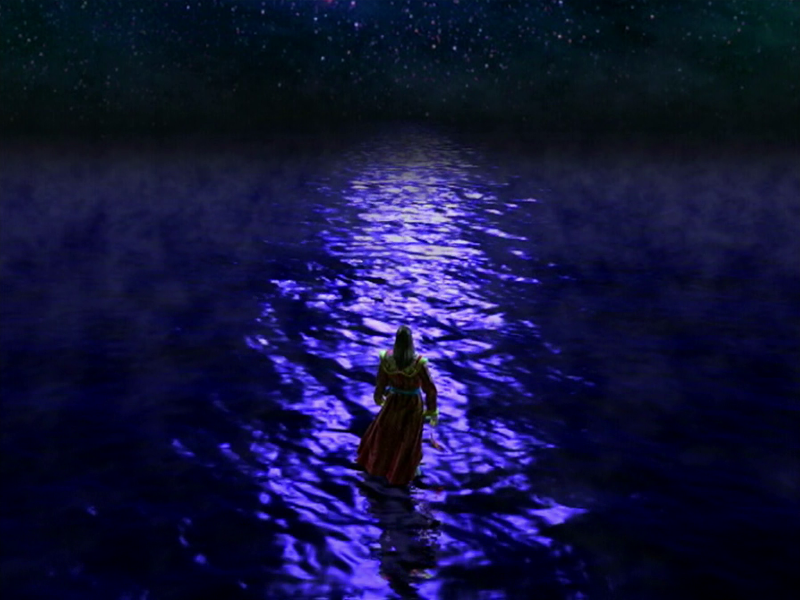 The narrative is handled rather loosely throughout the game’s main “Musou” mode, featuring generic cutscenes prior to each battle rather than character-specific stories. 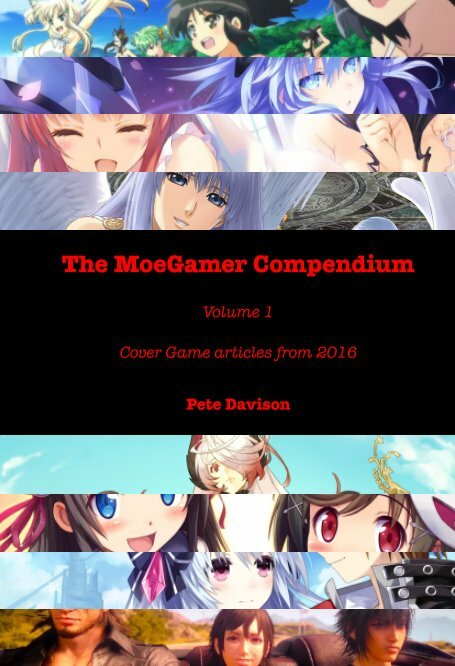 Which character you pick does make some changes to how the game plays beyond their basic mechanics, however. Playing a different character in the same stage will mean you start in a different location and have different foes to contend with until the disparate parts of your army meet up with one another, for example, and this gives repeated playthroughs a bit of added interest. In terms of how they fight, each character does handle markedly differently, however, primarily due to their varied weapons. 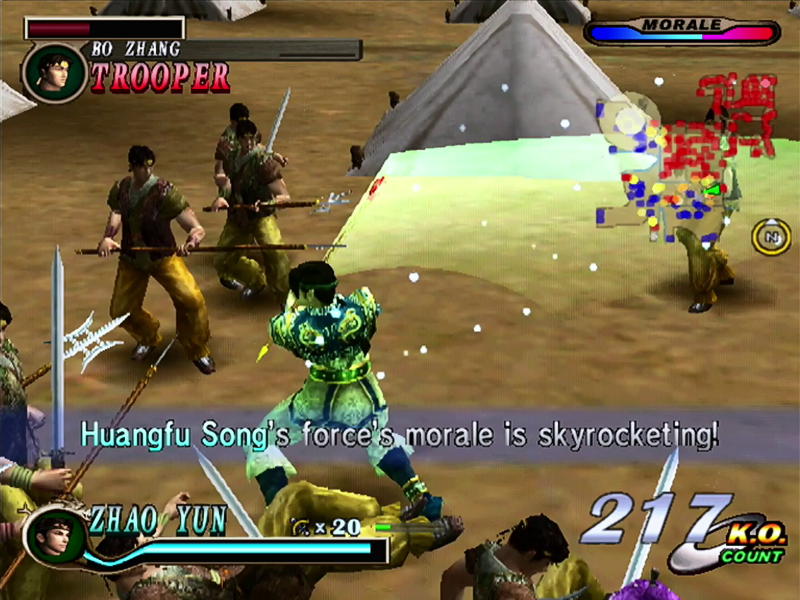 Picking a character such as Sun Shiang Xiang, for example, requires you to get right up close and put yourself in danger quite frequently, while a spear-wielding fighter such as Zhao Yun allows you to keep a bit of distance between you and the enemy. A striking difference between Dynasty Warriors 2 and Hyrule Warriors is that the whole thing is rather slower-paced and more methodical. In Hyrule Warriors, the hordes of basic footsoldiers are little more than fodder to allow you to bump up your KO count and generate energy in your various meters for special attacks. In Dynasty Warriors 2, however, even a simple grunt can put up a fight, and it’s very important to have good situational awareness, because getting surrounded is very bad indeed. I did play a bit of Dynasty Warriors 2 back when it originally released, but I found it very interesting quite how pronounced this difference in approach really is. Although the basic mechanics of Dynasty Warriors 2 and Hyrule Warriors are very similar, this different focus requires you to play much more cautiously, sticking with your allies and only pushing forwards when you’ve dealt with the immediate threats surrounding you. The fighters in Dynasty Warriors 2 on the whole feel reasonably agile in terms of getting their attacks out, but the lack of a dodge-roll (which is crucial to success in Hyrule Warriors) is something that takes a bit of adjusting to here, as does the lack of a lock-on function and full camera control. You can quickly recentre the camera behind your warrior by tapping L1 (or lock it in that direction by holding L1, which also allows you to guard against frontal attacks) but this isn’t quite the same as being able to keep an enemy in sight or simply rotate the camera with the right stick. Neither of these are as big of an issue as you might think after a few minutes of play. 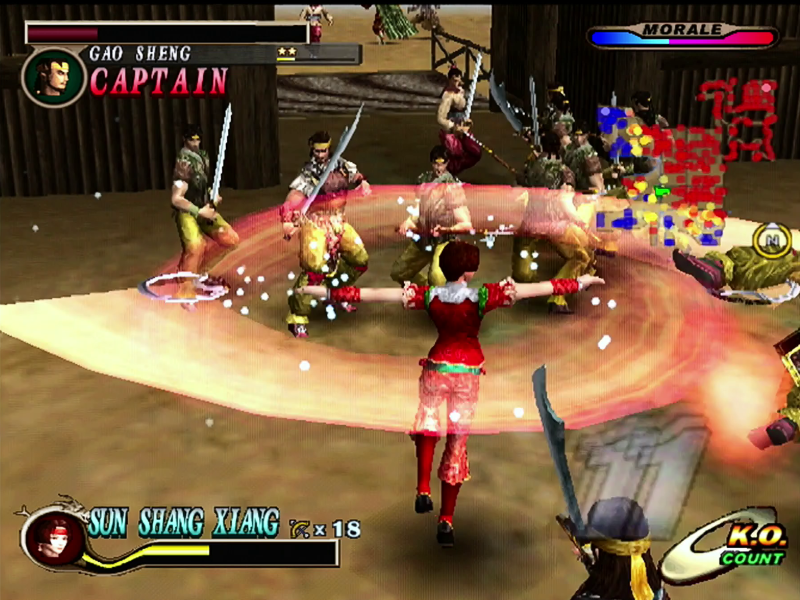 What I do particularly like is the old implementation of how Musou attacks work. Rather than being a predefined, cinematic move that attacks enemies around you, triggering Musou mode in this grants you a brief period of invincibility, during which you perform sweeping, powerful attacks. Best of all, you can cancel into Musou from most animations, making it probably the most reliable (and certainly quickest) way of escaping from a situation where you’re surrounded by foes. And with how quickly the bar charges, you can use it a whole bunch. It’s by no means a “win” button, either — enemy officers can still block your attacks, for example — but it’s an interesting addition to your arsenal of attacks. Another thing I like which the Warriors series as a whole kind of dropped after a while is the old-school beat ’em up approach of all enemies having a prominent health bar on the screen when you hit them — more recent games only bring up dedicated health bars for boss enemies. It’s actually very helpful to have a clear indication of roughly how much damage each of your attacks do against fodder foes, as this helps you determine which combos are the most useful. And while later installments (including Hyrule Warriors) do at least allow you to turn on small health bars over the heads of basic troops, it’s nowhere near as helpful and clear as it is here. 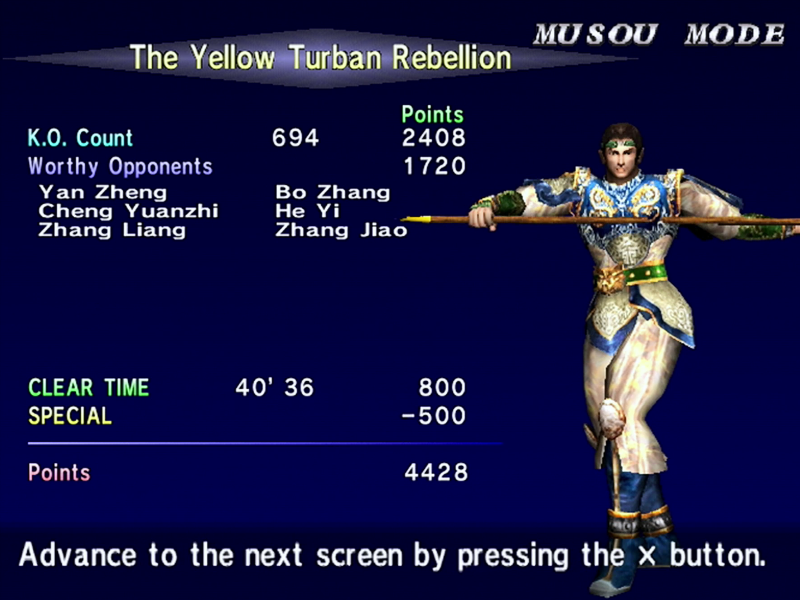 There are a few peculiar elements in Dynasty Warriors 2 that I rather like, too. Levels are extremely long and have no checkpoints… unless you happen to find one inside a breakable object, at which point you can save your progress. It’s frustrating to get knocked down after 30-45 minutes of fighting and end up with nothing to show for it — but it also encourages a certain amount of “risk versus reward” as completing a mission quickly gives you more points and allows your character to become more powerful more quickly. Progression in Dynasty Warriors 2 primarily comes down to finding collectible powerup icons during battle. Certain units on the battlefield are guaranteed to drop particular types of items, and defeating them with a good combo can improve the quality of that item. Rather than being equippable weapons or armour, the collectibles are instead straight increases to your warrior’s stats, leading to a direct and immediate increase in power with no micromanagement needed. And that sort of sums up the Dynasty Warriors 2 experience, really; it’s a no-frills Musou game that, looking back on it 18 years after its original release, is actually rather appealing precisely because of its lack of bells and whistles. You can just jump right in, have a bit of strategic hack-and-slash fun and then set it aside for a bit. 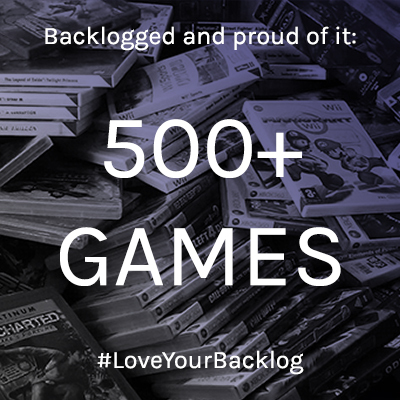 Like most Musou games, there’s a lot of depth and longevity here if you care to invest your time and attention — but there’s also no obligation to if you just want to have a bit of fun. The Musou series may have come a long way, but sometimes it’s fun to look back at where we’ve been — you might just find a fun game that passed you by back in the day! This is some serious nostalgia here… I have the DW4 at home and it has been pretty entertaining (I admit to simply smashing the buttons to get the AOE or stun combo sequence rather than timing attacks).